Applicants are required to complete a Personal Statement for each application that is submitted. The statement should include information on any area of special interest within the program they have selected; previous experience while working or volunteering in a related field; and career plans as perceived at present. Special thought and consideration should be made to this statement. The personal statement should be at least 1 page in length. The personal statement and C.V. / resume should be attached to the on-line application as a Word or pdf file. It is recommended to use font styles similar to Arial, GT Times or Times New Roman. Font size should not be smaller than 10 points, or larger than 12 points. Page margins should be 1″. The personal statement is separate from a student’s resume and C.V. and the application will not be considered complete until the statement has been received. Applicants are welcome to include a Resume or C.V. as a separate item. Please see Special Program Requirements to review instructions for those academic programs that require specific information contained within the personal statement and/or C.V. Applicants may submit a statement of prior research experience. This statement should include your role in the research, description of your project and any outcomes. Please include information on any presentations or papers resulting from the project. In addition to the required personal statement, a number of our academic programs require supplemental material such as a writing sample. Please refer to the Special Program Requirements webpage for a complete list. Applicants for degree programs are required to submit three (3) letters of recommendation in support of each application submitted to the Graduate School. Applicants are allowed to submit additional recommendations if desired. 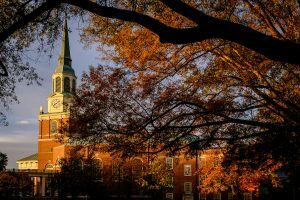 Applicant is transferring to the WFU Graduate School with their faculty mentor. Give careful consideration to each recommender that you select. These individuals should have personal knowledge of your academic qualifications; work related ethics; or experience interacting with you in a volunteer or community related activity. Forms will be provided electronically to recommenders during the online process. Letters of recommendation may be addressed to “Dean of the Graduate School”. All recommendations must be submitted electronically via the ApplyYourself online system. You will enter the names and contact information for at least three recommendation providers. Once the recommender information is saved in the online application, an email will automatically be sent to the recommendation provider with an access code and instructions on how to proceed with the online recommendation. It is recommended that you contact your recommenders to verify receipt of this email. If for some reason the email was not received, you will be able to log back into your application and send a reminder email by checking the appropriate box beside the recommenders name on the “Recommendation” panel. If you are making application to the master’s program in Biomedical Science, and select “Biomedical Science/PH-MS”, the pre-medical post-baccalaureate area of concentration, you may request that letters of recommendation submitted through Interfolio be sent directly to the Graduate School’s Admission Office to replace or supplement the electronic recommendations. Provide each recommender’s name and institution affiliation on the online application and mark that the recommendation is to be received “off-line”. Recommendations submitted through AAMC can not be used. Three recommendations are required to complete your application. Unofficial transcripts will be accepted for the review process and should be attached to the on-line application. Applicants are required to submit transcripts from each college or university attended or attending. ONLY if an offer of admission is made and accepted will official transcripts will be required prior to orientation. Official transcripts must arrive in a sealed institutional envelope and initialed on the back flap by the certifying officer. If submitting multiple applications, please attach an unofficial transcript(s) to each application. International applicants must submit transcripts which have been translated into English by their university, or a credential evaluation service such as World Education Services (WES) http://www.wes.org/. If a conferred degree is not on the transcript, then we will also require official copies of your degree certificate and/or diploma. NOTE: Transcripts, degree certificates and/or diplomas that have been translated by the student will not be accepted. If you are requested to send official transcripts, please mail to the appropriate Graduate School office.